Casting Call for Warrior Voices New Dates to be Announced Soon! 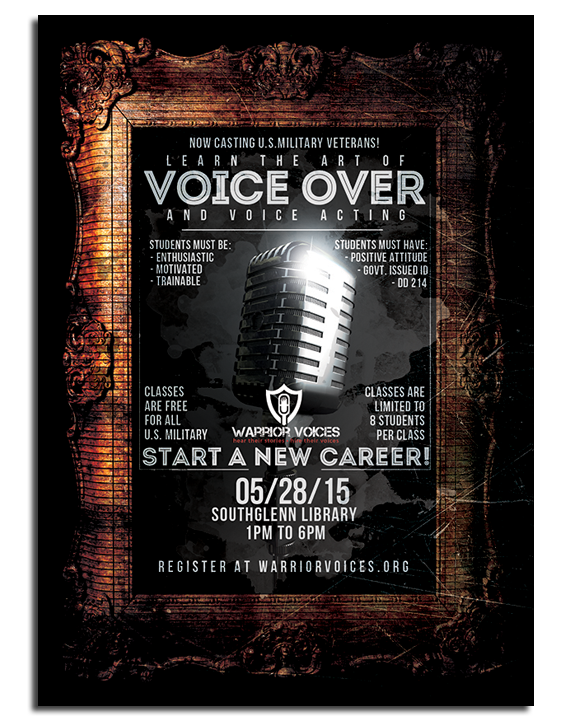 We are recruiting veterans* who will be selected to attend the Warrior Voices Ltd Voice Over Academy. The recruiting day is open to any gender, regardless of disabilities. This Casting Call will be limited to eight (8) veterans. First Come First Serve - There will be no charge for the recruiting event. *Any veteran of US Military who possess a DD-214 with an RE code of Honorable or Medical discharge. Other types of discharges can be discussed on a case by case basis. *Must possess valid government issued state identification or passport. *All documents must be verified by Warrior Voices Management prior to attending the casting call on 09/10/15. Attendees must have a desire or interest in learning Voice Over. Instructors will be looking for a “Can Do,” motivated and team first attitude. Instructors will be looking for individuals who can take direction and apply it. No prior experience necessary, as we are recruiting for our Voice Over Acting Academy. VOICE OVER ACADEMY will also be no charge.